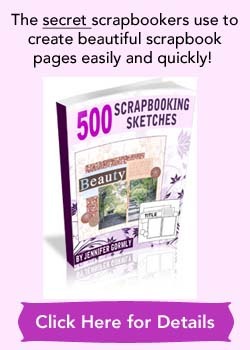 Looking for ways to stretch your scrapbooking dollars? Buying discount scrapbooking supplies will help you save some money on your scrapping essentials and the latest scrapbook products. I’ll share with you some shopping tips, and also talk a bit about how your personal scrapping style will affect your buying decisions. For items you know you’ll be using regularly, buy in bulk to save more. To sample the latest products, try to buy one unit of the item till you can determine its usefulness. If you know your personal style, for example you love using buttons or ribbons as embellishments, you can buy these in bigger quantities. To save time coordinating colors, buy cardstocks in prepackaged packs. If you find yourself hesitant about matching patterned papers with cardstocks, look out for companies that offer coordinating lines of patterned papers and cardstocks. Watch out for sales. Keep a list of supplies you need to buy in bulk. Then grab them during the sale period to maximize your dollars. I usually wait for sale periods to load up on cardstocks which I need a lot of. Clearance sales are fantastic too as you might uncover scrapbooking gems at unbeatable prices, as the scrapbook store has been wanting to clear off these items. I bought a couple of scrapbooking books during clearance sale at a fraction of their usual prices. Love it! While you’re shopping for discount scrapbooking supplies, keep your personal style in mind. Latest trends and products don’t mean they are up your alley. Not being caught up with the latest trends and supplies might mean you can shop more wisely for discounted items. You might notice that you keep using some accents on many of your scrapbook layouts. These are like your “old friends”, so don’t be afraid to buy more of these especially if they are at discounted prices. Of course, when there’s discounts on the latest supplies, it’s a good signal to try out some new products you’ve been eyeing on. In small doses though. You can always can buy more of this new product on your next shopping trip, once you know how you like it. Because if you were to go ahead to load up on a new product before determining its usefulness, you might end up being stuck with supplies you know you won’t be using for a long time. And then you’ll have to find means to dispose them. To look at a wide variety of scrapbooking supplies at discounted rates, check out Scrapbook.com. Be sure to check out their Daily Deals & Coupons and also their Clearance sections! I hope you’ll find some great deals today! I am a beginner at Scrapbooking, and have some supplies, as I went to a Creative Memories party, but never did anymore with it, and now that I am retired, thought I would consider starting again on my own. I have quite a bit of 8 x 11 size pages, but my album is 12 x 12. Can I use them as a background? Or do I still need to buy 12 x 12 card stock, and use what I have another way? Am interested in learning online or videos. So thank you for your help in getting me started. If you like to start creating 12″x12″ layouts to fit your 12″x12″ album, you can use your current 8″x11″ paper for matting your photos or cut them up into smaller pieces to be used as journaling boxes. You can put your existing 8″x11″ cardstock or patterned paper to multiple uses. You can also create your layout on the 8″x11″ cardstock and then adhere it to the 12″x12″ cardstock to fit your 12″x12″ album. If you prefer the 8″x11″ size, you can create scrapbook pages in this size and then get a 8″x11″ album to hold your layouts. The important thing is to start with what you have and create scrapbook pages. 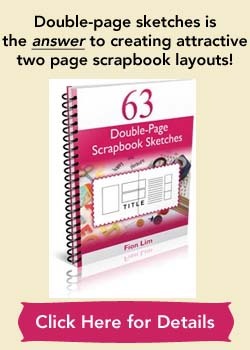 After a while, you’ll know which size you prefer to scrapbook in and you can create more pages in that size. Happy scrapping!